We meet on the first Tuesday of every month in Room 101 of the Casa Del Prado building in Balboa Park. Our Culture class (formerly the novice class) starts at 6:30 pm and the General meeting starts at 7:30 pm. Meetings are free and are open to the public, except for the May and December meetings which are member & invited guests only. 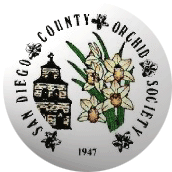 Additionally, the San Diego County Orchid Society hosts American Orchid Society judging on the same night as our regular meetings. Judging is held in Room 104 of the Casa Del Prado building starting at 6:00 PM.